After taking just a bit of a blog break, we're back! And so is our holiday stationery - all of our best sellers are back, along with a few additions to the pack. Many of our most popular pieces are our most modern, so we focused on adding a few more simple holiday cards to the collection. With new additions to our Editor, Utility, and Letterkast lines, we're glad to offer holiday card choices in our most popular stationery collections. Special thanks to Matt's dad Joel for building us the amazing wood background for these photos! He built it out of weathered pallet wood, which he works with a lot. We're helping him set up an Etsy shop in the coming weeks for his pallet creations! A special package arrived in the mail sometime last week - a new font from M&H! And not just any new font, a new font that has to do with something exciting we've been working on for a while...but I can't tell you what yet! A surprise, coming soon to this very blog. Here in Portland, the grass is bright green, flowers are everywhere, and the trees are full of leaves - spring has definitely sprung, and summer isn't too far away. It might be raining endlessly today, but summer in the Pacific Northwest is one of the most perfect summers there is. Hot but not humid, never a drop of rain, and lots of bright sunshine. Only an hour from the ocean, or half an hour from the beaches on Sauvie Island on the Columbia, we wanted to make a nautically-inspired wedding suite. It's called Newport! Named after a great town on the Oregon coast. So far, we've printed just the save the date - the invitation set will feature suitably bright yellow envelopes. Here it is, in metal and paper! After a month of not really printing anything new because of Matt's leg injury (a long story, but he's all better now), we've started working on new wedding designs again! This is our newest, and it's called Boathouse. It features a lovely typeface designed in the 1950s by one of the most prolific type designers ever (Hermann Zapf - you probably have many of his fonts on your computer). We picked envelope colors that would warm it up, since we didn't want the modern design to get too sterile. 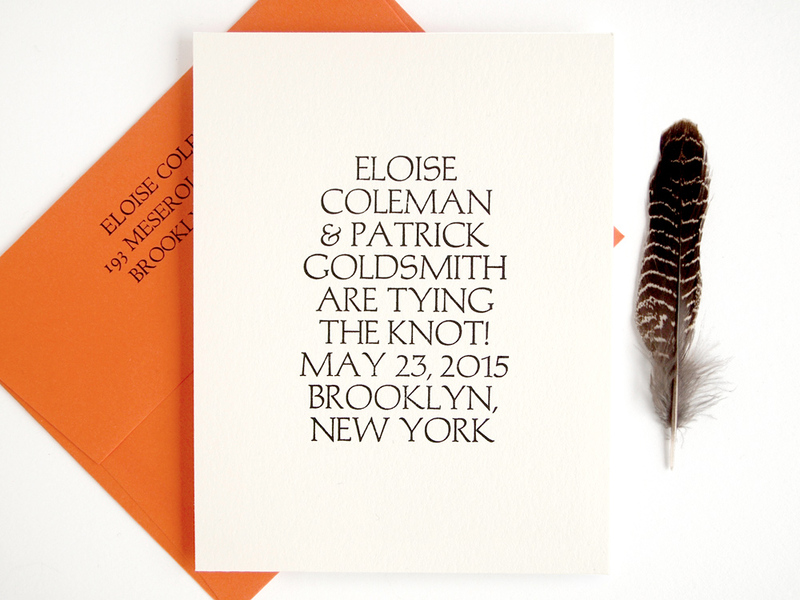 The orange envelopes match the save the dates, and the pale yellow and kraft go with the wedding suite. We love how it turned out! The nice thing about how we work is that our pieces always look better than they did on the computer. Partially because many of the fonts we use were never digitized, so we have to use weird, similar fonts that don't look as nice. Partially because, for us, digital typesetting is a lot hard to get perfect than traditional typesetting. Partially because seeing something on paper will always look better than on a harsh computer screen. Whatever the case, we love our Boathouse - it's the direction we're taking the shop, and we couldn't be happier! Some images of our newest wedding suite, Atrium, in metal form.